Finished writing the WebSocket chapter for the second edition of my Java 24 Hour Trainer. In this blog I’ll show you one of the code samples from lesson 28. Pretty often you need to write a program that publishes the same message to all connected clients. For example, multiple clients of the online auctions have to be notified when a new bid is placed on the product. Another example is when a new stock price quote need to be pushed from the server to all connected clients. With websockets it’s a pretty easy task. 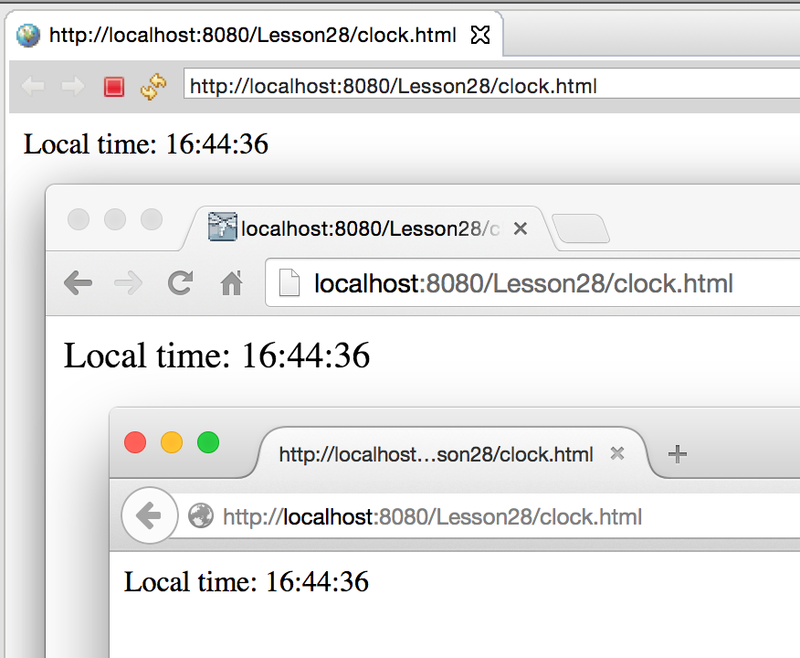 I’ll show you a basic example when a WebSocket endpoint pushes the server’s time to all connected clients. If you can publish the server’s time to all connected clients, you can publish any application-specific data. The following endpoint WebSocketClock schedules the task that gets and formats the server’s time every second and publishes the time to all connected clients. I schedule this timer once when the first client connects to our endpoint. The method sendTimeToAll() finds all connected clients by invoking getOpenSessions() on the Session object. Then on each session it calls getBasicRemote().sendText(). The next screenshot shows how Eclipse internal browser, Chrome, and Firefox display the current time published by my WebSocket endpoint. Three Web clients get current time published by a WebSocket endpoint every second. We’ve just started to work on the curriculum of the new online training titled “Modern Web Development for Java Programmers”. This course will be taught by practitioners from our company, Farata Systems. The initial desription is here: https://github.com/yfain/WebDevForJavaProgrammers. Every time I start teaching my new Java class I’m looking at the Swing units in the manual asking myself, “Why my students need to know Swing framework?” Well, I need to teach them how to program GUI, event listeners, asynchronous worker threads and event loop that are pretty much the same in every programming language that deals with UI. My students create applets and test them in appletviewer, then they are going through hard times trying to run them in Web browsers… In the end, I tell them that they won’t be going doing Swing programming in the real world projects. I also tell them that if Amazon.com would decide to re-write their UI in Java they’d be out of business in no time. If not with Swing framework, how should my Java students learn GUI programming? There is another Oracle product called JavaFX. It’s a better looking wrapper for Swing. It still runs on JVM, so Amazon would go out of business as quickly as with Swing, but at least with a better looking UI. Recently I was attending a presentation on a particular Eclipse plugin that could produce Web reports. The speaker was using Twitter API to demonstrate how easy it was to generate a report finding tweets based on a certain hashtag. Tada….Report is generated, the Web browser opens the report’s URL and pops up the modal dialog asking to enter the search parameter. What an ugly dialog box that was! Eclipse grey style, 90% of its real estate was empty with an input field on top prompting to enter the parameter’s value. No one in the audience (all Java developers) seemed to care. They are all used to ugly GUI in enterprise applications. OK, this product was using RCP UI components, but the Swing ones are definitely not better. The sooner Swing is deprecated the better. Even if JavaFX has no future in the Web or mobile applications, it has to become a mandatory replacement for Swing. Just because it promotes a better looking UI. Just because it promotes better taste among Java developers, who live in two different realities: the ugly depressive GUI at work and the eye candy world of iOS or Android applications. Let’s make a first step toward merging these worlds by killing Java Swing framework. The recording is available here. This is an interactive recording – you can switch it to the full screen mode. If you are going to attend any HTML5 conference, most likely you’ll see some of the speakers using Web browsers for presentation slides. The audience likes it cause it’s cool. A month ago one of our software engineers presented this way at the conference for Web developers. There is an extra benefit in using such html-based slides especially when your presentation is about Web applications. Just think about it, when the time comes for a demo, you are not leaving the Web browser – the next “slide” has the URL of your demo right in the address bar of your browser and you do the demo right there. Hit the right arrow, and the demo turns into a slide again. Isn’t it cool? Yes it’s cool, but not practical. Because everything else in not as cool and requires a lot of work comparing to Microsoft’s PowerPoint or Apple’s Keynote. Say, you want to add an image to the slide, make it smaller, and move it to the top right corner of the slide. In Powerpoint your hand just does it automatically. In HTML slides it’s a project. How about font manipulations? In Powerpoint you don’t even think about it – you just do it. In HTML slides it’s a project. Animations? Which one you want? Just pick one from a dozen that are readily available in PowerPoint. You want the image to fly from the top, bounce a couple of times and settle in the middle? Takes 10 seconds to pick the image, 20 seconds for testing, and another 5 second to remove this flashy-bouncy-flying effect cause it would make your audience dizzy. I’m sure this will be easy in the HTML6 era, but the HTML5 tooling is not there yet. How about embedding media into slides? OK, ok, you got the message. Next week I’ll need to find some time to migrate that HTML presentation into the tried and true PowerPoint slide deck. Yes, I’ll be switching from PowerPoint to the Web Browser when the time will come for the demo. This is a drawback. But every other aspect of making a presentation in PowerPoint or Keynote is superior to HTML. I’m observing the same situation in the enterprise world, where some IT managers are diving into new HTML5 project without thinking about the consequences. If you guys want to be cool, just dive right into the cold water. If you want to develop an application that will contain 100% of the required functionality – wait a couple of years for HTML5 tooling to mature. But if you want to be cool now, eliminate half of the required functionality and do your 100-screen enterprise Web application in HTML5. Today, at the meeting with a prospective client I said that if you decide to implement the same functionality in HTML5 vs. a mature platform with a compiled language and predictable VM, multiply the development time by two. Now I’m thinking I was wrong. The time should be tripled. Our publisher sent us for approval the image of a cover of the upcoming book on Web development. We were told that the name of the bird is Roseate Spoonbill. Why they decided that Roseate Spoonbill should be associated Web development will remain a mystery. 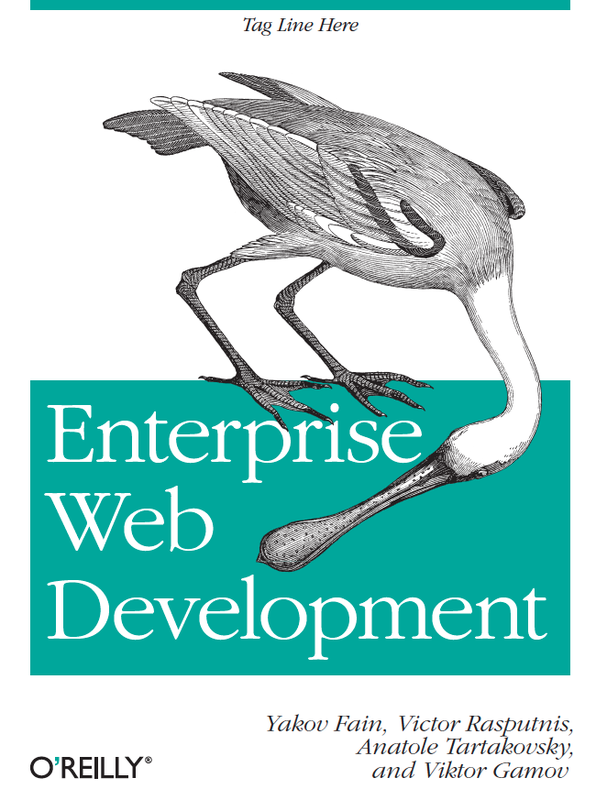 I guess, since the beak of this birdy is pointing at the word “Web”, the customer of the book store should think to himself, “Hmm, I have no idea what kind of bird this is and I don’t know how to develop for the Web. Let me buy this book!” In the unlikely event that you’re also not overly familiar with Roseate Spoonbill, please refer to THE SOURCE. Till this day Microsoft Excel is the most popular application among business users in the enterprises. They start the application locally, it has a local storage that enables work in the occasionally-connected scenarios. Both the data and the code are physically located close to the user’s heart. Microsoft Excel allows the users to have her own little pieces of data and amateurish-but-working-code (a.k.a. formulas) very close and personal. Right on the desktop. No need to ask these IT prima donnas for favors. No dependencies on the connectivity or some mysterious servers being slow or down. The most advanced business users even learn how to operate MS Access database to further lessen the dependency on IT. Most likely the publisher won’t let this epilogue to finish the book, and this blog will remain the only place this text will be published. Amen, bro!